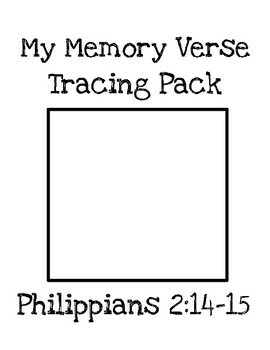 I updated last week’s Bible Tracer to include Philippians 2:14 and 15. On Monday, Parker traced his Bible verse while listening to the coordinating Sing the Word track. On Tuesday, Parker listened to and illustrated his verse. On Wednesday, we cut it apart like a puzzle and he put it together in his Bible lapbook while listening to the track. This week we continued reading about the ancient Roman empire. Part of our reading was about Rome attacking Romania with catapults. I added a catapult clip to our Sonlight Core B playlist and set out the supplies for Jordan to put together. He followed along with the step-by-step tutorial and came up with a pretty simple and cool craft stick catapult. I created an I Can Read It! worksheet set for this week’s lesson. 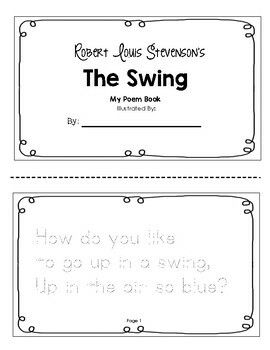 You can download it here for FREE at our TPT Store. Parker used his dot paints to complete the Roll, Read, and Cover worksheet on Monday. He brought out his crayons to complete the Read and Color worksheet on Tuesday. This week Parker was reviewing synonyms. 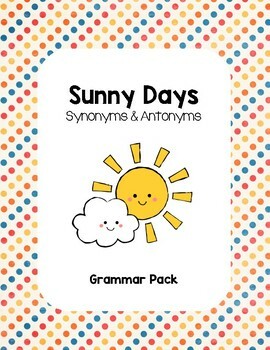 I created a Sunny Days Synonym & Antonym pack. You can purchase your copy here at our TPT Store. There’s a bonus FREEbie in the Preview! First, he used mat to sort through his antonym and synonym word cards. With very little help from me, he read and sorted the stack of word cards. 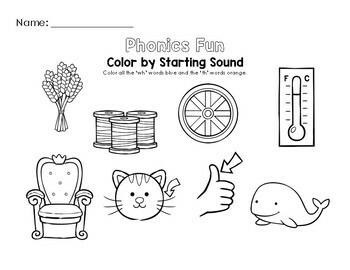 Afterwords I gave him the Sunny Days Synonym Sun & Cloud Match worksheet. He did a great job color coding all the matching synonyms. This week we reviewed base words using Jordan’s spelling words from Sonlight Core D. I created spelling word cards and cut out flowers, stems, root veggies, tops, and gave the boys a sky/land paper to create their own “My Root-word Garden”. We read each spelling word and looked for root-word and a prefix (beginning) or a suffix (ending). In this example, Jordan read “painting” (e.g. root-word=paint, ing=suffix). Since the root-word was combined with a suffix, we chose a flower and stem combination. He wrote the root-word on the flower (top) and the suffix on the stem (bottom). In this example, Parker read “dislike” (e.g. root-word=like, ing=prefix). Since the root-word was combined with a prefix, we chose a stem and root vegetable combination. He wrote the prefix on the stem (top) and the root-word on the carrot (bottom). When they finished putting together their garden. They wrote “My Root-word Garden” on the top. They turned out really cute and colorful! 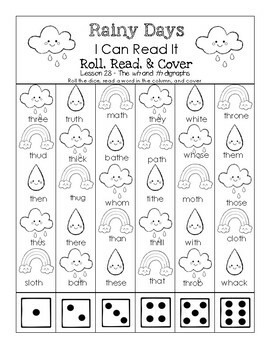 I created a simple Color by WH or TH Words worksheet for Parker to work on. You can download your FREE copy here at our TPT Store! Parker said each word and colored it by the starting sound. Jordan started memorizing If by Rudyard Kipling for his FIAR Wee Gillis unit. I thought it would be nice for Parker to pick a piece of poetry too. Each day he would read, trace, and illustrate a page from his poetry book. This week Parker was practicing his number words, tens counting to one hundred. I created a number word match game for him. 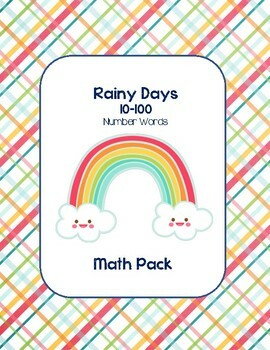 Later, I created a fun Sunny Days Number Words pack. You can purchase your copy here at our TPT Store. I made number cards and number word cards for Parker to match. We used bean sticks to count out each number. I sketched a “color by number word” picture for Parker to color in his math notebook. 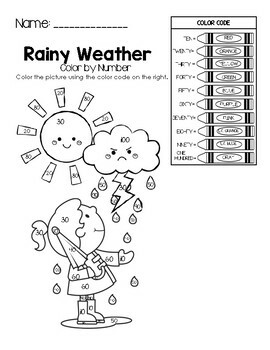 I’ve created a Rainy Weather Color by Number worksheet that covers the number words 10-100. You can download it for FREE here at our TPT Store. Jordan was learning about sheep in his FIAR Wee Gillis unit, so I thought it might be fun to do a little sheep craft with the kids. Parker and I read Where is the Green Sheep? and started making our pom-pom sheep. He did one white and one green (of course). I used the glue gun and he added each item. They turned out REALLY cute. Big sister made a blue and purple sheep and big brother made a white, green, and turquoise sheep. This week the kids had on-campus MAP testing in addition to their regular studies. By the end of the week, everyone was pretty beat. We decided to surprise them with a dinner out for sushi (their favorite)! Everyone chilled out with miso, salad, terriyaki, and of course, sushi! Well, that’s it for week 28. See you you next week for more learning fun!